In most conversations we have had with international brands in the last 2-3 years, India consistently appears on list of the top-5 markets in which to expand into. The second most populous country in the world, India has a young population that offers a vibrant population mix that will provide a workforce and consumers in decades to come. There is steady growth in per capita income and a greater availability of credit, as well as a significant change in the consumers’ outlook to life that has propelled consumption levels. The United Nations Conference on Trade and Development ranked India as the second most attractive destination for global foreign direct investments in 2010. 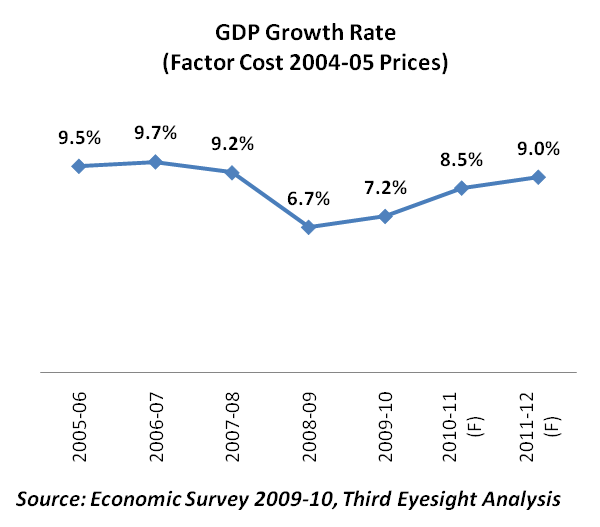 The lowest recorded GDP growth rate during the global slowdown was still a decent 6.7 per cent. This growth rate is expected to have returned around 9 per cent in 2011, and is driven by robust performance of the manufacturing sector, as well as government and consumer spending. The ongoing opening up of the economy over two decades and its robust growth has steadily attracted brands and retailers into the country. Many of them have now been in the country since the early 1990s, and the numbers have grown exponentially during the last 8-10 years. Despite this, the market is far from saturation and many more international brands are actively scouting the market. Many of them are value brands in their home markets and may, therefore, be more a logical fit into a “developing” market, but there are also plenty of premium and luxury names on the list. For instance while the growth has largely been led by soft goods product brands, as incomes have grown, the presence of more expensive consumer durable brands has also expanded. While the journey to the Indian market has not been a smooth ride even for the well established and successful international brands in the market, brands that have invested in understanding the psyche of the Indian consumer, adopted flexibility in market approach and displayed persistence, have been paid off handsomely. Some international brands have exceeded domestic brands in size and reach, while others have had to reconcile to being niche operators. Some have seen profits while others may have their senior management wondering what fit of madness brought them to tackle this market where they can only dream about making money sometime in the future. Typically, when looking at a new market the very first question anyone would ask is: what is the market potential for brand? However, you should also be prepared to ask yourself: what need is the brand addressing and what is the value being offered by the brand? How would it be able to effectively and efficiently deliver that value? In many cases, for those entering a non-existent product category a more basic question is: “Is there a need for my product offer?” Just because a brand is huge somewhere else in the world does not automatically make it desirable to the Indian consumer. While most brands want to target the Indian middle-class millions, their sourcing structure and strategy places them out of the reach of most of the population. Brands that have succeeded in creating a significant presence, maintaining their brand image and having a sustainable operating model have, almost uniformly had a significant amount of local manufacturing. Notable examples from fashion include Bata, Benetton, Levi Strauss, Reebok, among others. In case of certain food brands such as Domino’s and McDonald’s, the companies have collaborated with and developed their vendors locally to bring down costs, and improve serviceability. Apart from the costs and margins, another important issue is that of the adaptability of the product mix. Brands that are sourcing locally and have a significant product development capability in India are also able to respond to specific needs of the Indian market better, rather than being driven by what is appropriate for European or North American markets. This is an enormous advantage when you are trying to be “locally relevant” to the consumer in an increasingly cluttered marketplace. Indeed the question is more to do with the brand’s willingness and capability to create a product mix that is most suitable for India through a blend of international and India-specific merchandise. The famous “Aloo-tikki” burger by McDonald’s is a great example of a product specifically developed for the Indian consumers. Not just that, India is probably McDonald’s only market in which its signature dish, the Big Mac, is not sold. Of course, flexibility in tweaking the product to suit Indian market can become a concern when it amounts to losing control over the brand direction, and mutating away from the core proposition that defines the parent in the international market. Many brands wish to control every aspect of product development head office, but this also severely limits their ability to respond to local market needs and changes. A one-size fits all strategy obviously will limit the number of consumers that the brand can effectively address in a market such as India. Another key question is: what is the degree of control that a brand wants to exercise on the brand, the product, the supply chain and the retail experience of the consumer? The corporate structure itself may be determined by the internal capabilities and strategies of the international brand in their home market or other overseas markets. A brand that has presence through a wholesale business in the home market may not have internal capability or experience in retail, and would look for an Indian partner who can fill in the gap. Based on whether they want direct operational control over store operations, international companies can set up fully owned subsidiaries or joint ventures to manage the business in India. 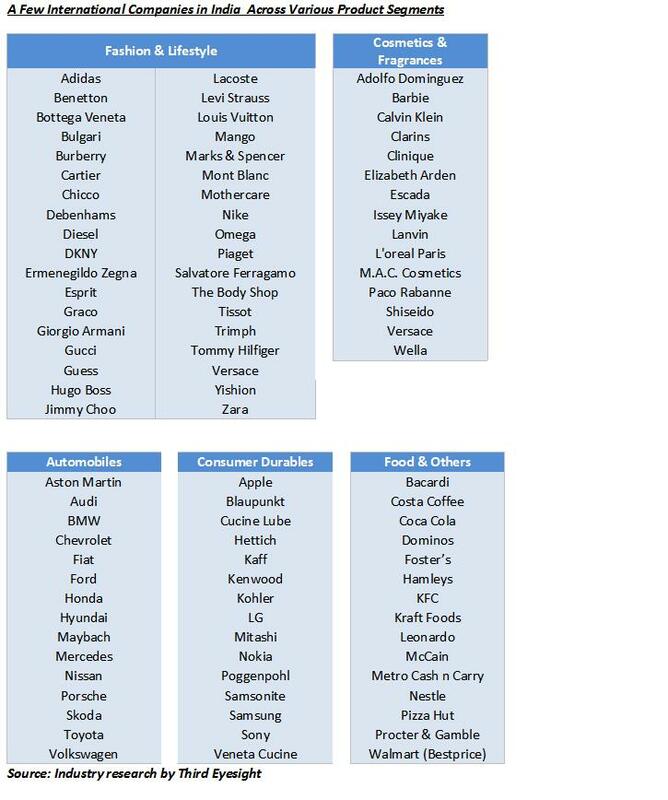 Many brands prefer to take a slow and steady approach as they do want to exert a significant amount of control over the business (including companies such as Inditex, the owner of Zara, and other retailers such as Wal-Mart and Tesco), entering only when they are fairly confident of being able to closely manage the business in India right up to the retail store. During our work we have come across both extremes – companies that want to manage the minute details of the India business out of their own head offices, as well as companies that are so hands-off that they only want to hear from their franchisee or licensee when things are especially good or particularly bad. While a balanced, middle-of-the-road approach would be the logical one in each case, in reality individual styles of the top management have a huge influence on the approach actually taken. Also, the size of the potential market segment – relevant to the brand – has an important role to play in the strategy. If the brand is meaningful only to a small segment of the population, or priced at the top-most end of the market, one company may choose to establish an exploratory distribution relationship, while another might choose to set up an owned presence rather than look for an Indian partner to handle their small business. While perfect partnerships seldom exist, companies could be a lot more careful we have found them to be, in questioning the criteria and motivations for choosing partners. In some cases, financial strengths, or past industrial glory were qualifying factors for picking franchisees, and the relationships have failed because the business culture was divergent from the Principal’s. In other cases, partners have been picked because they “have real estate strengths”, but no consideration has been paid to whether the partner has the operational skills to manage a fashion brand. On several occasions, franchise relationships and joint ventures have split because one or both partners find that their expectations are not being fulfilled, or the water looks deeper than it did when they got into the business. The opportunities in India are many. As the managing director of one international brand commented in a conversation with Third Eyesight, India is a market where a brand can enter and live out an entire lifetime of growth. However, international brands do need to carefully identify what role they wish to play in the market, and what capability and capacity they need operationally to create the success that can truly root a brand into the rich Indian soil.